In recent years the Product Life Cycle of OEM products has shortened dramatically. The latest innovation is rapidly succeeded by the next. An experienced partner with up-to-date knowledge of applications can make the difference in the development of your product. The ERIKS specialists and engineers closely cooperate with design engineers, production planners and quality departments in the OEM market. As a result, ERIKS possesses in depth knowledge of products, applications, markets, logistical concepts, current and future legal standards. This knowledge is shared intensively with our clients, which results in innovative solutions for your applications. Over the years this cooperation has developed to co-engineering. We provide you with advice and sophisticated solutions for the technical and logistic challenges you face in this industry. ERIKS is your engineering partner from concept to product. Flange gaskets and die cut parts are often low cost items and therefore considered as low priority. ERIKS knows the consequences a failing seal might have. 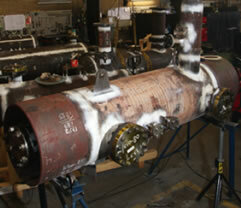 A seemingly insignificant part can turn out to be a major problem and can cost a lot of time and money. We supply you with advice on the right gasket or die cur part so you will always select the best product for your application. The ERIKS product range is broad and deep. Many products can be delivered from stock or will be manufactured at one of our production facilities. These items vary from C-rings for use in extreme conditions to small rubber parts for use in delicate applications. With all our parts you can count on our expertise and a swift delivery. When you are looking for a solution for a specific application that is not in our standard range, ERIKS can develop the right component. We have all the means necessary to deliver a product according to your needs and which exceeds your expectations. Spiral wound gaskets are used for high pressure and temperature applications. ERIKS has a selection of all conceivable models and in various materials. In addition, special gaskets can be made quickly in our own production facility. 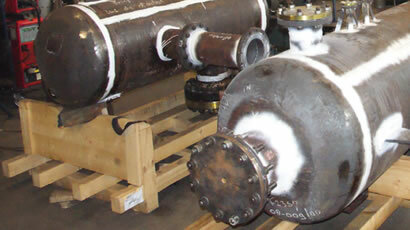 Camprofiles and MRG gaskets are often used as heat exchanger gaskets. ERIKS can produce these very quickly in our production location in the Netherlands. The standard dimensions for DIN and ANSI flanges are available from stock. Great deals of special metal seals are used in industries and in applications for very low leaks, high temperatures and pressure. Metal O-rings, Helicoflex® and other specially turned of stamped rings are excellently suited for this. The ERIKS know-how is also evident in the RX® range of sealing products. Tried and tested over the years the RX® range has a proven reputation for value and high performance varying from Fibre sheet materials to a wide range of metallic products. Whether you will produce a mass product or you build an exclusive one-off, ERIKS will make sure your product has the high-quality it deserves. Furthermore, our goods, both incoming components and finalized products that are to be shipped, are subject to an extensive quality check if desired. It is also possible to send the products to our laboratory to perform more complex chemical or mechanical tests. Even when you work in a clean room environment ERIKS can deliver the goods completely cleaned and packed accordingly, thanks to our own facility in Alkmaar. Our clean room meets the highest standards and is ISO 14644-1, class 7, certified. This extra attention for quality makes ERIKS a partner you can rely on. Through experience we have learned that the price of a product is just a small part of the procurement costs. The ERIKS Easy Order System® is a combination of various logistical solutions and services that helps our clients to significantly reduce the procurement costs and Total Cost of Ownership. These logistical concepts vary from simple forecasts to complete integration of E-business. The extensive product array, large quantities of stock on over 20 locations throughout the Netherlands and various production locations enable ERIKS to deliver your products in a short period of time, 24 hours a day, 7 days per week. Even products with non standard dimensions have short delivery times because they can be manufactured on our own production sites. If you would like to know how the Easy Order System® could help you reduce costs, go to www.easyordersystem.com or contact us.